Sometimes, convenience trumps everything (especially with kids). 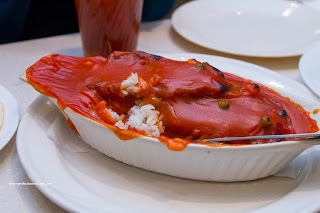 As much as there are many dining options at Metrotown (in the mall itself), most are downright terrible. Therefore, while we were there getting our Santa photos down (yes, this was in December), we went to an ol' standby being The Boss Restaurant. Ah yes, I remember eating 2 dishes myself there when I was a kid. No chance my son would do that, he can barely finish one small bowl. Even with that in mind, I proceeded to order more than enough starting with the regular - Breakfast A + B. Huh? No, this was not a skill-testing question or some sick algebra joke, rather, it was the combination of 2 breakfast items for one price (can be ordered separately as well). 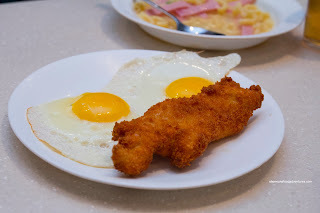 The first dish was the Sunny Side Egg with Fried Basa. What? Fried fish for breaky??? Well, it was a whole lot better than the "wiener". 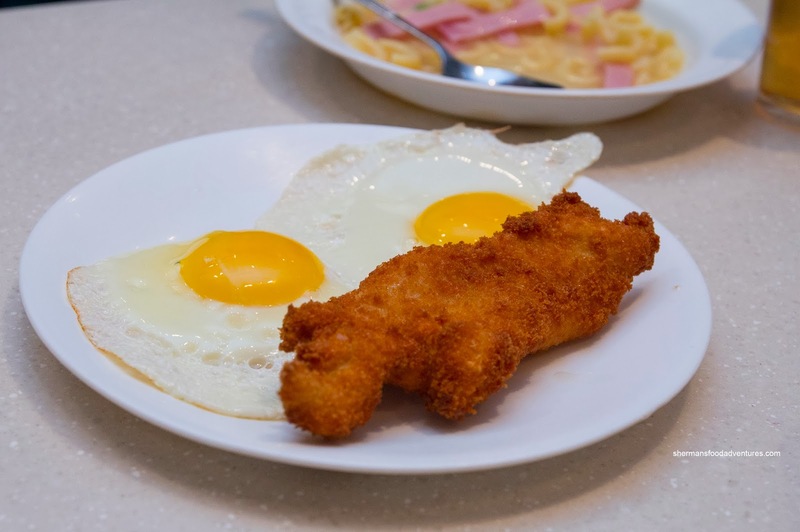 That's right folks, you get a wiener for breakfast at a HK-style cafe. Hey, the fish was good being crunchy on the outside and super moist on the inside. Eggs done nicely too. The second item was the Ham & Macaroni in Soup. Okay, breakfast is different here alright? WYSIWYG really with this, but the chicken soup was decently flavourful. For myself, I wanted some tongue. 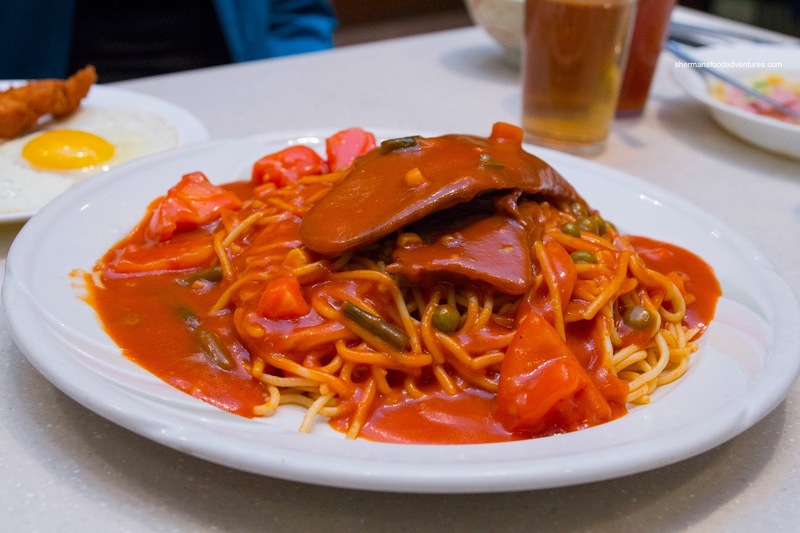 Yes, I really did, in the form of the Ox Tongue with Spaghetti. Now if the sauce looks a lot like watered down and sweetened ketchup, you are completely right. 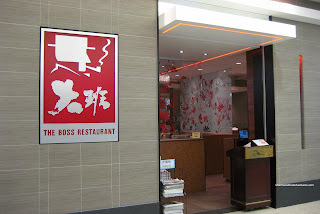 Yah, it'll make Italians roll over in their sleep, but for a HK-style cafe, it's normal. With that in mind, the sauce was a good consistency where it also had a balance of sweetness and tartness. The pasta was somewhat al dente while the ox tongue was tender and fatty. I offered Viv some, but she hates tongue (uh...). On the other hand, she loves the Baked Pork Chop on Rice instead. With a very similar sauce albeit a touch more tart and thick (from the baking), it was pretty good. The fried rice underneath was chewy while the pork chop was still somewhat crispy and moist. For our last dish, we had the Pork & Preserved Vegetable Fried Vermicelli. 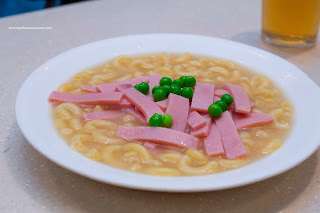 In years past, this would be made with BBQ duck, but they got rid of it (probably due to the high cost). This was still pretty much the same except for the change in meat. It exhibited plenty of wok heat where the dish had moisture, yet not dry. In terms of flavour, I thought it was seasoned enough where it let the preserved vegetable do most of the work. Once again, The Boss was a pretty predictable experience. However, the portions have gotten significantly smaller over the years. Also, it doesn't seem like the service has changed much either. I could never quite get the luncheon meat/spam etc. 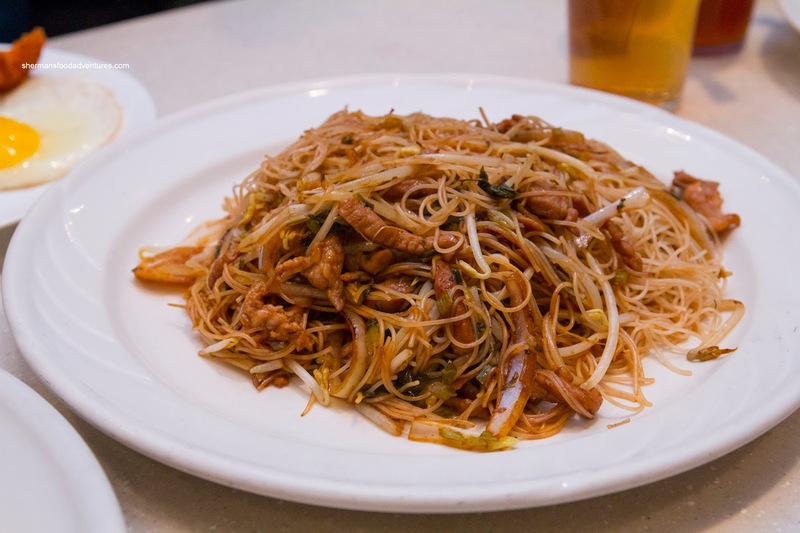 they serve at these HK-style cafes, for breakfast.